International Public Art/Marlborough’s mission is to be a world-class advocate for our clients in the development, presentation and execution of public art and other large scale commissioned art projects, with an emphasis on the integration of art, architecture, and the urban and natural environments. International Public Art/ Marlborough (IPA) is a division of Marlborough Gallery Inc. committed to the development of museum quality art projects for an international clientele that includes, cites, states, provinces, countries, private corporations, museums and individual collectors. As a practice, IPA advocates art as an integral part of community development; we further believe that over time, communities evolve and achieve greatness through the definition and integration of economic and cultural objectives. While well-managed, commercially viable communities may thrive economically, a rich community life and pride of place is achieved through the creative and thoughtful integration of economic and cultural mediums. World-renowned artist Beverly Pepper has been commissioned to integrate public art into the constructed landscape within the new Ralph Klein Environmental Education Centre and Legacy Park (formerly Shepard Wetlands Legacy Park).The public art will support the Legacy Park's vision and mission, which includes promoting awareness of environmental issues and sustainable behavior, and will contribute to the park's 'outdoor classroom' objective. The artwork will grow from the design of the park, be integral to its forms, and will articulate the inter-relationships between various aspects of the constructed wetland, the park and the environmental education centre. Constructed of soil, sod, ecologically compatible grasses and core-ten steel for the sculptures, Pepper aims to create a "place" whose "physical image and presence will attract the general public, as well as those who are [already involved] in the arts... [She] will strive to create a timeless physical presence - to make works that seem to exist outside of historical time and regardless of a person's specific knowledge of art, one will be moved by the sheer visual and physical force of the work." Inspired by watching a pair of hawks circle and spiral against the vast dome of the sky during her site visit, the piece has the working title of Hawk Hill (Collina Falco). Begun in 2008, this project is slated for completion by July 2010. Summary: Beverly Pepper has been commissioned to integrate public art into the constructed landscape within the new Ralph Klein Environmental Education Centre and Legacy Park. Beverly Pepper’s monumental sculpture, Ptolemy’s Wedge, was commissioned by the Library Board of the City of Minneapolis and the City of Minneapolis, Minnesota for the new Minneapolis Central Library. Installed in 2007, Ptolemy’s Wedge complements the Cesar Pelli-designed Central Library’s Nicollet Mall main library entrance plaza by signifying it as the gateway of this important civic institution. Made of steel with a soft, oxidized reddish brown surface, the sculpture weighs 6200 pounds and is engineered to withstand winds of up to 100 mph. Combining rich illustrations, photo essays, and an analytical text by Eleanor Heartney, Kenneth Snelson: Forces Made Visible traces both the artist's artistic and personal development and his working process over the span of his five-decade career. Kenneth Snelson: Forces Made Visible is published by Hard Press Editions of Lenox, Massachusetts and is available for sale on Amazon. At 18’ feet high and 12.5’ at its widest, the sculpture's presence at the Banker's Court Building in Calgary, Alberta, Canada, is defined by its scale and gestural movement. Pepper's vision manifested as a sculpture of monumental scale that accentuates the arrival and entry experience while not overwhelming or crowding the site. 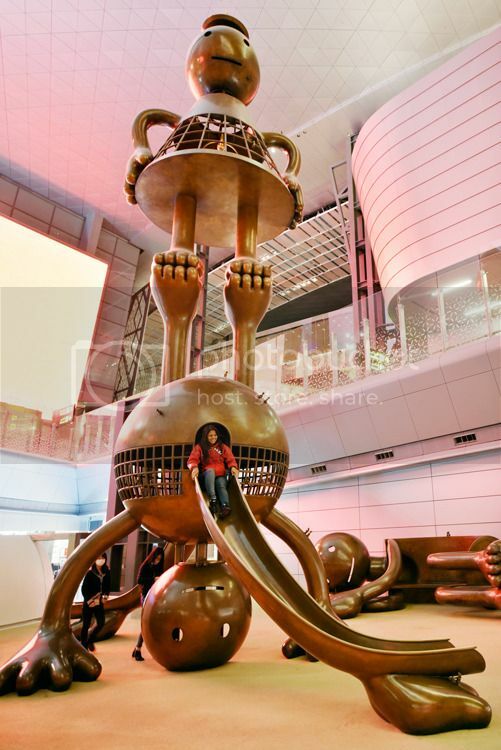 Summary: A view of Pepper's sculpture Nuova Twist at the Banker's Court Building in Calgary, Alberta, Canada. The New York City Department of Parks & Recreation, The Broadway Mall Association, Marlborough Gallery, and the New York City Department of Transportation are pleased to announce a public exhibition of monumental sculptures by Spanish artist Manolo Valdés from May 20, 2010 through January 23, 2011. The exhibition will include sixteen bronze sculptures along Broadway from Columbus Circle to 166th Street. Each sculpture will include signage that displays mobile phone access numbers for an English and Spanish language audio tour with informative descriptions of the works. The monumental sculpture Gran Elefandret, 2008, by renowned artist Miquel Barceló will be on view at the Union Square Triangle through the end of May 2012. Since its debut on September 13th, the inverted pachyderm has been warmly received by New Yorkers. Please see below for selected press items on Gran Elefandret. Gran Elefandret on Bomb Magazine's blog. Gran Elefandret on WNYC's Culture page. Gran Elefandret on The Wall Street Journal's Photo Journal. Gran Elefandret on Bloomberg's New York Weekend. Gran Elefandret on New York One. Gran Elefandret on The Art Newspaper. Summary: A round up of press items about "Gran Elefandret"
The Atlanta Botanical Garden and Marlborough Gallery are pleased to present a group exhibition entitled Independent Visions: Sculpture in the Garden, featuring works by the artists Magdalena Abakanowicz, Chakaia Booker, Red Grooms, Clement Meadmore, Michele Oka Doner, Beverly Pepper, George Rickey, Kenneth Snelson, and Manolo Valdés. The exhibition will be on view from May through October 2012, and will comprise nineteen sculptures. Learn more about the exhibition by clicking here. The New York Botanical Garden and Marlborough Gallery are pleased to announce an exhibition of monumental sculpture by Manolo Valdés. On view from September 22, 2012 through May 26, 2013, Manolo Valdés: Monumental Sculpture will include seven bronze, cor-ten steel and aluminum sculptures ranging in size from well over 17 feet tall to more than 50 feet in width. The sculptures have been sited to take maximum advantage of the Garden’s dramatic views with special attention given to the visual impact of the changing seasons. The artist has designed the installation to include surprising changes in the visual character of the sculptures throughout the seasons. Learn more: read the full press releas by clicking the prompt, buy tickets to The New York Botanical Gardens exhibit, and view available work by the artist. Explore the interactive public art map to learn more about international public art created by Marlborough Gallery's artists. Click here to learn more about Marlborough Gallery's International Public Art. KENNETH SNELSON, E.C. Tower, 2006, is on loan for exhibition to the Pratt Institute. The sculpture is sited on the campus directly in front of the Myrtle Hall. This work is a prime example of one of Snelson's tensegrity structures, a word created by the philosopher Buckminster Fuller to describe Snelson's structural innovation by combining the words "tension" and "in­tegrity." That combination manifests itself here in webs of stainless steel tubes and cables that are held in highly stressed, structural arrangements through the push-pull balance of compressive forces in the tubes and tension forces in the cables. If Max Bill, the artist and Bauhaus teacher, was right when he claimed that art can greatly evolve from the basis of mathematical thought, then one could assert that the theory and practice by which Snelson has developed his art is the ideal amalgam of science and art, of breathtaking engineering and visionary structural and design purity. Born in Pendleton, Oregon in 1927, Snelson graduated from the University of Oregon and served in the US Navy in World War II. After the war he enrolled at Black Mountain College in North Carolina where he studied with Josef Albers and encountered Buckminster Fuller. In 1951 Snelson studied with Léger at the Academie Montmartre in Paris and by 1960 created his first large-scale works whereby he entered a new, innovative artistic territory. He lives and works in New York. Please enjoy the video above featuring young airport visitors interacting with the installation. The public exhibition of six new monumental sculptures by the acclaimed Spanish artist Manolo Valdés took place from September 8 to October 5, 2016 at Place Vendôme in Paris. Located in the 1st arrondissement, the site served as an architectural setting for the group of sculptures by Valdés: female heads in aluminum, iron or marble, their unique ornamentations on unforgettable display.